A truly elegant looking wordpress theme made entirely with the most soothing colors. It is a theme made by a proper blend of white and light grey color. The theme has a distinct header that most primarily focuses on real estate and the housing sector. The header also features a traditional navigation bar with rounded edges. This is a two columned fixed width theme that has a pleasant content area for the display of the updated articles or posts written to the website regularly. The post titles in the content area are blue colored with rounded edges. The sidebar features a distinct search area and also provides links to the other pages. A classic looking, well designed attractive wordpress theme with all the basic requirements. This wordpress theme has a fine looking header that focuses primarily on real estate and housing issues. The header includes with itself a traditional navigation bar that directly links to the other categories. The theme is a fixed width, two columned wordpress theme. 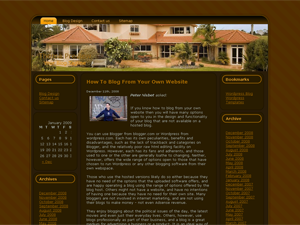 The header, content area and the sidebar of the theme features rounded corners which gives it a variant look. The content area hosts the round edged post titles which will put up the daily posts written for the website. The side bar provides links the theme with the other pages. This is a very attractive looking green-blue wordpress theme. The theme has a prominent and attractive looking header with sharp edges. This wordpress theme has a traditional navigation bar just below the header that links with the other pages. It is a fixed width two columned theme. The sidebar, content area and the post titles of the theme have the rounded edges. The theme has a clean and distinct sidebar with various links to the other contents. The content area hosts a beautiful comments section that puts up the regular comments posted for your sites.